One April evening, a small group of neighbors gathered on a big sunny back porch to begin a conversation. Some of us were meeting for the first time. Others had worked together for years on the board of the Lake Claire Community Land Trust. The topic was the level of sound at the Land Trust’s bi-monthly drum circles and occasional music festivals. This had become a point of contention when a young couple moved in directly behind the Land Trust and found us an unexpectedly noisy neighbor. The issue was not resolved that night, but steps toward compromise were made. And something else occurred, something at once magical and mundane. The evening began with neighbors becoming acquaintances, and by the time it ended we knew a little about the minds and hearts behind the faces and the names. By putting conflict to the test of peaceful conversation, we were acting on our commitment to turn a neighborhood into a community. The conversation continued on a Sunday afternoon in May when a larger gathering convened in the Lake Claire Cohousing Common House, across the cul-de-sac from the Land Trust’s main entrance. This time each household on the three surrounding streets received an invitation, and we hired a professional mediator to facilitate. About 25 people came. This was a broader conversation that was long overdue. We heard from neighbors who had been silently putting up with us, formed new relationships, and opened avenues of communication for the future. People all over Atlanta know instantly what you mean when you mention “the Land Trust,” even if they never heard of a neighborhood called Lake Claire. Technically we are not even a land trust. Our 1.7-acre greenspace contains no housing, just trees and paths, 60-plus garden plots, a playground, a solar-powered well, a Japanese meditation garden, a tiny farmlet, a pond inhabited by a large tribe of frogs and turtles, and one beloved emu. Amid the greenery are two gazebos, a sauna, a restroom, a deck with a view of Atlanta’s downtown skyline, a small wood-heated structure for winter gatherings, and a stage and amphitheater. The land is owned by a 501(c)3 nonprofit made up of neighbors, and is protected from development by a Conservation Easement. It is the result of 30 years of volunteer efforts, a handful of grants, and a multitude of modest donations from neighbors and a wide circle of supporters. People who move in next door to a high school know they’re getting football crowds, stadium lights, school buses, and chattering teens. People who move in next to a city park know they’re getting picnic and playground sounds, soccer or tennis matches, and (in our neighborhood, at least) an annual over-the-top music festival. People who move in next to the Land Trust don’t necessarily know what they’re getting. What they’re getting, above all, is an opportunity for endless conversation. We aren’t City Hall or the school board, just a neighborhood greenspace trying our best to be a good neighbor. For better or worse, becoming a neighbor of the Land Trust sometimes requires joining the conversation and getting drawn into the vortex of community. That’s what happened to me when after living down the street for over 10 years—and after surviving a bout with cancer—I decided to trade in my long-distance commitments for a nonprofit endeavor right in my neighborhood. This ongoing conversation, I slowly realized, is an end in itself: a sort of group spiritual practice that is the true heart of community. It has been going on since well before my time, when a small group of neighbors first began to discuss what might happen to three empty lots the transit authority was using to build a new rail line along Dekalb Ave. It’s a conversation that will never reach a final resolution and fall silent, since issues will always arise among neighbors, and in the end community is the only alternative to eternal warfare. The young couple who sparked this particular dialogue represent the changing demographics of Lake Claire, which is rapidly gentrifying. Homes that change hands here these days are frequently knocked down to build something bigger. To the new arrivals, the Land Trust is easy to take for granted, a neighborhood park that happens to be privately owned. But unlike a park, as our new neighbors discovered, this tract of greenspace comes with a community, and like every community, over the years it has evolved its own quirky culture. The house the young couple bought had just been renovated, but they immediately gutted it to make it their own. They also cut down a huge oak that had probably helped to shield the previous owners from Land Trust noises. To their credit, when their baby arrived and had trouble sleeping through the drum circles, rather than suffering in silence or complaining to the police, they spoke up and joined the conversation. We tried various sound baffling techniques, limiting our decibel level during festivals, eliminating hoots and cheers and even cowbells from the drum circles. The dialogue continued by phone, text, and email. But in the end, nothing we could offer made them feel at home in their new neighborhood. And for us, the conversation made it clear that the sound of drumming and occasional amplified music was not just ornamental but something vital to our community culture. When the conversation reached a stalemate and began to repeat itself, the young couple did try calling the police. But Atlanta’s sound ordinance is not easy to interpret, and decibel levels are tricky to measure. The police recommended that we do what we were already doing: talk. Our neighbors finally had to recognize that they had bought their house and moved in after checking out the neighborhood, but without investigating the nature of the community that lives here. Rather than try to impose their values on us, they recognized their mistake and graciously bowed out. They sold their house and moved away, a new family moved in who genuinely love the Land Trust and all its noises, and everyone concerned breathed a sigh of relief. On one level this was a failure on both sides, time and effort gone to waste. It was sad to lose our new neighbors after they had invested so much. But in my opinion they did the right thing. The purpose of a genuine conversation is not necessarily to agree, but simply to understand each other. Of course it involves expressing one’s own viewpoint, but also a commitment to actively listen, accepting the views of everyone present as equally valid. No contribution to the journey of mutual understanding ever really goes to waste. Uncomfortable situations lead the conversation into new places that enrich us all. Regardless of failures and successes, the conversation goes on. One thing everyone agreed about that afternoon in the Common House was that having a Land Trust on our block is a positive thing. Those three lots overlooking a busy street could have become something we all detest. But since its founding in the mid-1980s the Land Trust has become many things to many people. It is a crossroads for not just one but many communities—neighbors who walk their dogs or rent a garden plot, families visiting the playground, the Children’s Garden, or Big Lou the Emu, drummers and dancers attending the drum circle, musicians who come for the Friday Night Jam, Boy Scouts and Brownies, the folks who sweat in our sauna at night or join an early-morning outdoor yoga class. We host weddings and memorial services, birthday parties for children (but not adults), fundraisers for other nonprofits and for ourselves. Every first-time visitor seems to have the same reaction: open-mouthed wonder at the lush greenery and peaceful ambience, followed by amazement that this exists 10 minutes from downtown Atlanta. Then, of course, they tell all their friends. Every other week we get a request for some new activity—filming, classes, concerts. The overwhelming majority of these we must decline, because our guiding principle is the comfort level of the neighborhood. We have a policy of “one quiet weekend a month,” which allows us our two drum circles plus one other public event every month. We have no off-street parking, so the constant stream of visitors can sometimes inconvenience residents coming home from work. Luckily, a nearby men’s shelter in a former church allows us to use its parking lot for public events, such as our musical fundraisers. 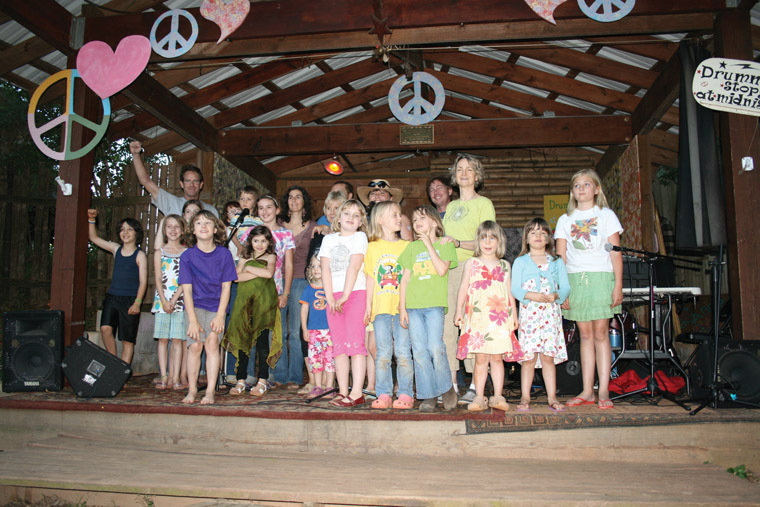 The festivals—our “Peace & Love Fest” in the spring and “Jerry Jam” Grateful Dead tribute in late summer—have been the Land Trust’s main source of revenue for many years. Their success depends on a loyal crew of volunteers who don’t necessarily live nearby, but belong to the wider community of Land Trust supporters. But the festivals also depend on a different kind of support from our closest neighbors. These are the folks who must tolerate the music and traffic and late-night voices on the street. Even if they don’t attend the festivals or even visit the Land Trust, without their patience we could not raise the funds we need. Like the residents in close proximity to parks and schools, they seem to understand that a community effort like the Land Trust is worth a certain amount of inconvenience. And in return, we are careful to balance their needs with those of the wider community. Our drum circles, too, are primarily attended by visitors from beyond Lake Claire. The drumming is audible to a smaller radius of neighbors, but occurs more frequently, so these events too have their impact on the neighborhood. A few years ago, when attendance declined, the drum circles stopped bringing in enough donations to cover the cost of staffing them. After some soul-searching, the Land Trust board decided to continue them anyway as a service to the wider community. The sound of drumming twice a month and the extra traffic and parking were already part of the balance we had been maintaining. That conversation was part of our ongoing exploration of the relationship between “community” and “neighborhood.” How can a neighborhood remain a community when it is continually changing? The Land Trust’s founders, the original “trustees,” are aging, retiring, stepping back one by one. Long-time neighbors who were deeply involved have moved away. New people moving into the neighborhood have different needs and expectations. Children who grew up here go off to college and leave the neighborhood behind. Sometimes we wonder who will carry on the intensive maintenance that keeps our land from being swallowed by the luxuriant vegetation of our semi-tropical climate. The families who established the Land Trust 30 years ago had moved into a block of “fixer-uppers” to raise their kids on a tight budget. They had pooled their savings to bid on the three lots. The developer they were bidding against backed out when the neighbors outbid him on one of the lots, leaving them the owners of a large tract of kudzu and holders of a large mortgage. They bonded around the hard work of clearing kudzu and trash, laying out gardens, building humble structures with fancy woodwork, raising funds to pay the mortgage with an annual “cul-de-sac sale” and street dance. They shared a monthly potluck, hunted Easter eggs in the spring, and carved jack-o-lanterns in the fall. The intensity of their shared focus transformed a group of neighbors into a tight community. But gradually a split developed. One contingent saw the Land Trust as a neighborhood project just for neighbors. Others began to see its potential as a gift to the world. The drum circles, founded in the early 1990s, began attracting people from all over metro Atlanta. The stage, originally conceived as a venue for amateur drama, was discovered by music-lovers, who plugged in to help raise funds. Teens invaded in search of a peaceful place to get high, and spread the word to their friends. The rift among the trustees widened until the conversation grew loud and caustic. They recruited a neutral neighbor to facilitate and keep the meetings peaceful. But finally the tension split the group, and the founders who did not appreciate all of Atlanta converging in their back yards departed. It was not an amicable parting. By the time I got involved, I marveled at how magically harmonious our meetings were. Each began with our customary blessing: “We come together in peace to share our visions, honor our differences, and create community . . .” I found the words a powerful and moving reminder of why I was there. It took me a while to realize why they had become necessary. The founders who still live here continue to share meals and vacation trips, help with illnesses, deaths, and births, and so on, all stemming from early relationships built on a simple goal. But most of them rarely walk down the street to visit the Land Trust. One of them is overtly hostile; for him the conversation is over. Not that he has given up complaining about the “tourists” who have invaded his neighborhood. But when I try to answer, speaking up for the positive influence of our green oasis in these people’s lives, his voice invariably rises and drowns out my response. His bitterness allows no room for anyone’s point of view but his own. But it’s clear to me now that creating a Land Trust just for neighbors never was a realistic goal. A “neighbor” is anyone who can afford a house in the neighborhood. As Lake Claire gentrifies, the price of living here goes up. New neighbors bring new values. Kids don’t stick around to carry on a legacy just because it was created for them. We still host Easter egg hunts and pumpkin-carving every spring and fall, attracting families who share our values wherever they may live. Change is inevitable. The land remains. Today the Land Trust community is defined not by geography, but by participation. Who keeps up with the weeding, the mowing, wood-chipping the paths, paying the bills? Who shows up for meetings and work days? Why don’t our newer neighbors see the value of our green gem and step up to participate? As the neighborhood changes, the only way to keep community alive is to keep communication open. The only thing that continues indefinitely into the future, besides the land itself, is the conversation. Land Trust board and committee meetings are dedicated to continuing the conversation that got us here. They are open to anyone, and often the eight current board members are outnumbered by equally dedicated friends and neighbors. New board members are drawn from this contingent who have proven their interest by showing up. Only board members can vote, but it is rare that an issue divides us so deeply that a vote becomes necessary. We talk, we listen, sometimes we pass the talking stick, and gradually the answers become clear. The current board includes one original trustee, and several others occasionally join us. I am one of several newer members who got involved after the founders broke up. Our meetings are a bridge between the old Lake Claire and the new. Once a year we hold our “annual meeting,” as all nonprofit corporations are legally required to do, and invite all of our diverse constituencies to come together. This year we were thrilled to see two of our newest neighbors, both parents of small children, show up and listen as the board discussed nighttime security and other mundane matters. Between meetings, the conversation continues via email. The board’s Yahoo group includes several dozen people who actively or occasionally speak up. Many a minor issue has been discussed and resolved without taking up meeting time. Other items that end up on a meeting agenda have been thoroughly aired and examined by the time we meet. But we have occasionally gotten ourselves into trouble by taking an issue too far in our virtual conversation that would be more productively discussed face-to-face. One recent incident highlights the importance of face-to-face conversation. In recent years we have been plagued by hordes of teenagers who are irresistibly attracted to our little oasis—to the point where we’ve had to hire an off-duty officer to discourage them from congregating after dark, when we are officially closed. One evening as twilight was falling, one of my neighbors encountered a young African American woman near the pond. Perhaps a little too sharply, my neighbor informed the young lady that the Land Trust would be closing at dark, and she abruptly turned and left. A few days later, we received an email from the visitor complaining that to her, the incident felt racially motivated. My neighbor sent back a humble, heartfelt apology. But the young woman never responded, and we all felt a bit remorseful at this lost opportunity. The Land Trust is one place in our race-charged city where black and white folks regularly cross paths with smiles and hellos. But this doesn’t magically create racial harmony; that takes vigilance, focus and attention, unblinking awareness of past traumas, and proactive “eyes on the prize” of a just society. In other words, it takes a conversation. Email clearly falls short. What my neighbor momentarily forgot under the accumulated frustration of a steady stream of young trespassers was that in our divided society, the issue of race is never far from the surface. People of color are individually as diverse as any demographic group; the one thing they all have in common is good reason to be wary of whites. It doesn’t matter that my neighbor intended no offense. It doesn’t matter that she has a bi-racial grandchild and a “Black Lives Matter” sign in her front yard. It doesn’t matter that she spoke in the same tone of voice she uses with everyone, especially young people crossing the Land Trust close to dark. Every encounter between people of different skin colors, no matter how trivial, will either advance the cause of racial understanding or set it back. The young couple with the newborn, the angry former trustee, and the offended African American visitor could all be regarded as embarrassing failures of the civilized art of conversation. Instead, I see them as examples that prove my point. Through the ordeal of conversation, the young couple found their way to another community that shares their values. The possibility of conversation is always open to the ex-trustee, should he ever decide he is willing to listen respectfully after speaking his mind. And our African American visitors have much to teach us if they choose to take on the challenge of conversation. The land itself is neutral ground, a quiet oasis amid the rumbling of the trains where life slows down to nature’s pace, a lush green garden that can nourish sharing and learning and the slow growth of relationships. Community, as Gary Snyder once pointed out, is the opposite of a network. Where a network connects like-minded folks who are geographically dispersed, community brings together the people of a particular place, who are inevitably diverse. And while many communities are “intentional,” most of the world’s communities are not. They’re made up of individuals who happen to share a neighborhood and must work out their differences without resorting to violence. In our case, the particular place is a greenspace we must learn to share; the community is a convergence of many communities, a microcosm of the diverse communities that must somehow learn to share our communal planet Earth. “Let us embrace the notion that the words we speak and the actions we take begin with good intention. This may help us listen with generous hearts and open minds.” Conversation, the bedrock of true community, is the exchange of viewpoints no matter how divergent, the act of disagreeing without being disagreeable. Even if no point of agreement is ever reached, as long as we succeed in keeping the peace—preserving respect between equals—warfare is averted and civilization remains a civil enterprise. All grownups understand this principle and live by it as best they can. I only wish the world was run by grownups. Stephen Wing is a poet, activist, and secretary of the Lake Claire Community Land Trust in Atlanta, Georgia. He’s the author of an eco-comic novel, Free Ralph!, two books of poetry, and 16 self-published chapbooks, including the “Earth Poetry” series. His original bumper stickers travel the world under the name “Gaia-Love Graffiti.” He has written for Communities in the past about the Rainbow Family gatherings, which he still attends. His poem about the Land Trust, “In Land We Trust,” was published in issue #170, Spring 2016. Read more of his work at StephenWing.com. We created the Land Trust for you. We didn’t realize it at the time; we were young then ourselves. Now we’re 30 years older. The land we gave our time, love, and energy to make so special will always be here, preserved from development by a Conservation Easement. But we will not. We are counting on you to carry on the work of caring for it when we are gone. That’s why this place is not just a Land Trust, but a Community Land Trust. Community goes back to ancient times when people lived tribally and depended on one another to survive. It’s the bond that holds indigenous societies together to this day. It is the “we” that balances the “me first” of modern-day individualism. Most problems in today’s world are caused by too much “me first” and not enough community. The Land Trust is one small place where community has been planted and is trying to grow. But lately we’ve been experiencing a problem with young people who come here with a “me first” attitude. They disrespect the land and the community by doing illegal things that harm our reputation among our neighbors, and by coming at night, when we are closed. If you enjoy coming here, join the community that keeps it going. Join us for community gatherings like drum circles and music fests. And join us for Community Work Days, giving back to the land that gives us so much. Since we’re a nonprofit, community service hours are available for volunteers. And you even get pizza! Money can’t buy community. But working together on something worthwhile makes it come to life. Try it out on our next Community Work Day, the third Saturday of every month, starting at 4:00 pm.